One of the benefits of loitering around this business for as long as I have is that you collect lots of interesting friends, many of whom pursue all sorts of game-related activities that you'd like to promote. Without further ado, here's what some of my friends are up to that my readers might like to know about. From Lester Smith: Popcorn Press is gearing up in two ways to publish its annual Halloween collection of horror-themed poetry. First, PP is raising money through Indiegogo so that, unlike previous years, it can actually pay contributors in something more legal-tenderish than copies of the collection. Second, PP is accepting submissions from poets who'd like to have their work included in the collection in exchange for plaudits, exposure, and some of that legal tender. If you compose horrifying (as opposed to horrible) poetry, get in touch. And back the project on Indiegogo. 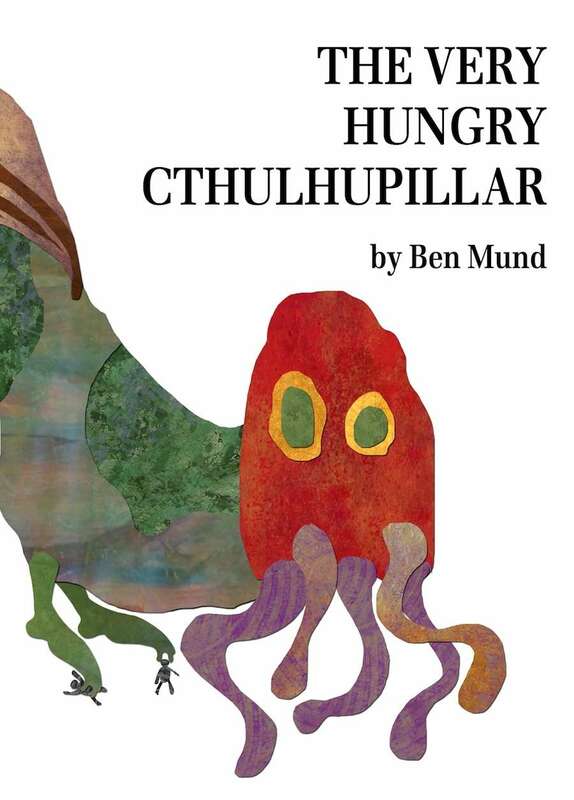 From Jamie Chambers: Ben Mund's The Very Hungry Cthulupillar is now available in PDF at DriveThruFiction. Just $3.99 gets you "16 pages of full-color illustration by Ben Mund, and will call back fond memories of childhood along with the maddening knowledge of our cosmic insignificance and forthcoming doom." This book is an amusing parody of a children's book intended for children of all ages -- except young ones. From Monte Cook: It's too late to actually get in now, since the funding window has closed, but you ought to at least be aware that Monte's Numenera project on Kickstarter broke the half-million dollar mark. That's from an initial goal of $20,000. Of course, it has Monte's creativity and productivity behind it, but still ... It's pretty amazing what this community can do with a bit of motivation. From Steve Sullivan: Steve's new steampunk novella Heart of Steam and Rust is available in all ereader formats. This is another tale set in the Steam Nations universe and featuring Lina Ivanova, the heroine from his previous book in this setting, The Last Ranodon. I hope to have more to say about HSR in the future, once it's percolated to the top of my reading list. From Doug Niles: Doug has wrapped up work on Eyeball to Eyeball, the first book of an alternate history series about the Cuban Missile Crisis. This series is also coming from Popcorn Press in October. According to Doug, "The 'alternate' part means that I make it worse, lots worse, than it actually was." October 22nd is the 50th anniversary of JFK's monumental speech announcing the discovery of nuclear missiles in Cuba, so you can expect the historical event to get lots of retrospective coverage. Once you know the real story, get the book and find out why we're so grateful to JFK. From Matt Forbeck: Next week, Matt is releasing Hard Times in Dragon City, the first installment of the "Shotguns & Sorcery" trilogy in his weird and wonderful "12 for '12" project. Shotguns & Sorcery is the second of four trilogies that make up 12 for '12. Words pour out of Matt the way smoke and cinders billow out of the funnel of a steam train. Finally, there was a terrific post at Wampus Country a few days ago about "making things worse" during an RPG session, plus a followup. Well worth reading. A few months ago, I wrapped up writing on an adventure for The Secret Fire RPG. It's titled (in a style reminiscent of the old TSR numbering system) "X1 The Rings of Death." To give an idea of what it's about, I offer up the introduction. This reveals slightly more than what characters know at the start of the adventure, so if you suspect you might face the Rings of Death as a player sometime, read on at the risk of spoiling a bit of your own enjoyment at uncovering the mystery surrounding the rings. The Rings of Cernossen have stood for millennia. They were raised by a race of men that ruled this part of the world thousands of years ago. These kings were among the first to learn the secret of iron. With it they dominated their neighbors, drove the marauding, blood-worshiping beast men into the forests and bogs, and cemented their rule. The great hill and its hollowed-out heart were sacred to this tribe. They erected the stones to honor their tribal deity Cernossen (a being who drew its power from the Elder God of Life), the antlered entity that brought fertility and abundance to their plains. Over the centuries, the tribe carved tombs from the hill to hold their royal families and further catacombs where priests could carry out rites to Cernossen. In roleplaying games, sometimes the characters who make up the adventuring party aren’t all at the same power level. In the olden days, that could be because a few characters died and had to start over at 1st level while the survivors were at 4th or higher, because one unlucky soul bore the brunt of the wight’s level draining, or because someone rolled a string of 18s during character creation. In newer editions, it tends to happen because a few players are experts at cramming every possible bit of destructive power into a character while others take a more casual approach, prefer to invest their points in something other than combat prowess, or simply don’t pay much attention to swords and arrows and other nasty things. No matter what the cause, the result from the GM’s point of view is a group of characters that’s hard to challenge. While Grimjaw and Skullbuster are chopping monsters into coleslaw, Sunflower and Gigglebear are being pulled inside out and dropkicked back to the Bush administration. What’s a GM to Do? 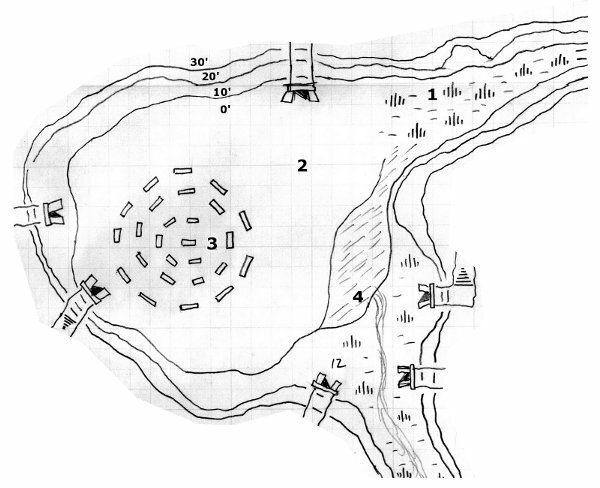 Phil Viverito's "Siege of Alesia"
It’s a piece of RPG legend that D&D arose from wargaming. Although that’s true, it’s a case of something not really meaning what people think it means. A more accurate statement would be that D&D arose not from wargames but from wargamers. After all, the magical spark at the core of D&D is that it wasn’t just another wargame; it was a little of this and a little of that rearranged into something startlingly new and different. But the inventors and early adopters of D&D were steeped in wargaming ideas, and they left a strong imprint on the game. Typically, this influence gets simplified to the most recognizable of the wargamers’ tools—miniatures—yet miniature figures are probably the least of the ways in which wargaming influenced RPGs. Early editions of D&D stated clearly that the game didn’t need miniatures at all. 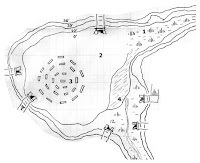 That was an important declaration, because rules for miniature wargames are what TSR published in the early 1970s. Anyone who bought a rulebook from TSR expected it to be for and about miniatures; hence the need to be up front about what people were buying. It’s curious, then, that the use of miniatures in D&D and its offshoots reached an apex here in the 21st Century. After being almost entirely written out of the game in 2nd Edition, minis came back with a fury in 3E and 4E. Some people love that 3-D emphasis and some hate it, with pretty much the same fervor displayed in religion and politics. It’s fair to ask, then, what purpose miniatures really serve in D&D. Are RPGs made better or worse by little plastic or metal heroes and villains? 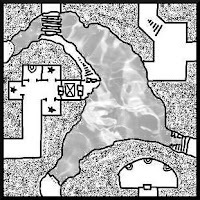 Even the king of the gnolls needs a safe cave in which to hide his treasure. Nothing, of course, is safe from adventurers who are bent on riches or glory. Since Next Innovator raised the subject of the location's puzzle in a comment, it probably deserves a few words of expansion. 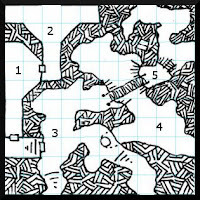 Because of the space limits inherent in Adventure Notebook, the puzzle is more brief than it ought to be. 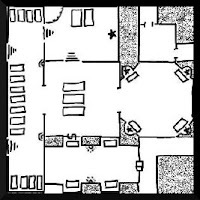 These constraints made it impossible to provide clues to how the puzzle should be solved. If it's played strictly as written, players will either guess right or guess wrong and that's that. A guessing game is not a puzzle. In play, I would embellish these bare bones with hints and feedback based on what the characters are doing. None of that feedback is written down, it's just something that I do, and I encourage other DMs to do the same. Insert whatever type of clues and feedback your players will respond to. You know what catches their eyes and sparks their neurons better than I do, anyway. These Adventure Notebooks are predicated on that type of improvisation. No Adventure Notebook this week. Family is visiting from out of state, leaving no time for dungeon design. There will be a new installment next week as usual. A person’s first experience with tabletop roleplaying will stay with him or her forever. That’s equally true whether it was good or bad. If the player didn’t like it, that player will never come back. If the player enjoyed the experience, the RPG club gains a new member and that person picks up a hobby that could last the rest of his or her life. So let’s say you’ve roped a group of colleagues or school chums into trying Catacombs & Catoblepases. Making a good first impression is vital. What’s your plan? Cast your mind back to your first experience with funny-shaped dice. Can you remember the thrill you felt kicking open your first secret door, cleaving your first goblin skull, surviving your first brush with 1 hit point, and counting and recounting those first tarnished silver pieces lifted from a bloodstained purse? Or was the best part slipping unnoticed past the patrolling manticore, negotiating with the gargoyles, and outsmarting the medusa? Maybe it was standing at the edge of the cliff and looking down on the lost city of ruined spires and soaring bridges that no civilized man or woman had seen for a thousand years. This week's installment of "Adventure Notebook" takes your heroes to a mysterious tomb that has attracted the attention of ... something bad. For more information than that, you'll need to grab the adventure and read it yourself. I'm rather fond of this one. I think it's my favorite so far.